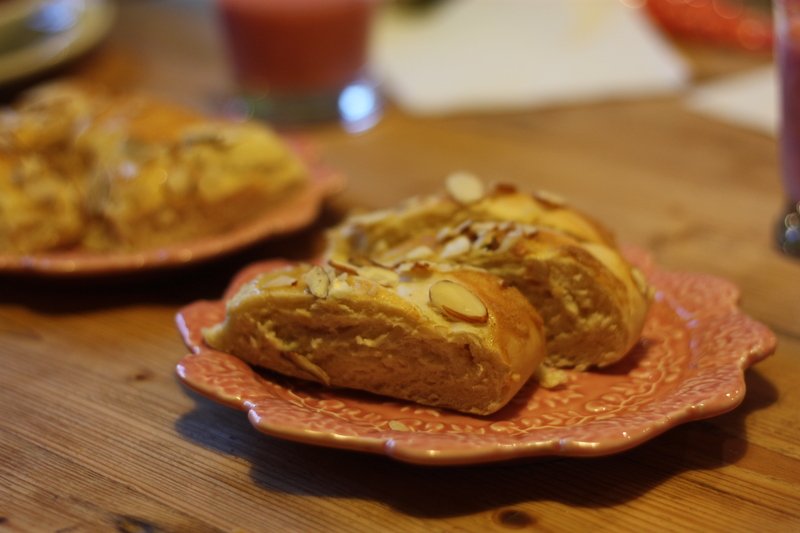 I always want to do something special for breakfasts on holiday mornings, and I’ve tried several different recipes, but this year, I was so happy with this strudel bread, I want to remember it for Easter next year. This recipe comes from Beth Hensperger’s Bread for All Seasons, a delightful book, and this bread/pastry was not terribly difficult, but unique and delicious (what I’m trying to say is that it’s actually my favorite thing to eat ever, and if I had no other considerations like health and weight, I would have it every morning). Anyway, for anyone else who’s a big fan of the cream cheese danish, here’s a great recipe for you to try! Note that the dough sits in the refrigerator overnight, so give yourself time in advance. I snapped the above picture, a couple of slices of the danish, which is all that remained in my house after breakfast from four loaves! 4. Using a large dough scraper, scrape the chilled batter onto a lightly floured work surface. Divide into 3 equal portions. Roll out each portion in to an 8-by-12-inch rectangle, dusting lightly with flour as necessary to prevent sticking. Spread each rectangle with one-third of the sweet cheese filling, leaving a 1/2-inch border around the edges. Starting from a long side, roll up jelly-roll fashion and pinch the seam together to seal. Pinch both ends to seal and tuck them under. Place on a greased or parchment-lined baking sheet, at least 3 inches apart. Using a serrated knife, score each finished cylinder in 5 places across the top, no more than 1/4 inch deep. Cover loosely with plastic wrap and let rise at room temperature until doubled in volume, 45 minutes to 1 hour. Twenty minutes before baking, preheat the oven to 350 degrees. 5. Bake in the center of the preheated oven 10 minutes. Meanwhile, prepare the brandied almond crust. In a small bowl, combine the egg yolk, brandy, brown sugar, and allspice and beat briskly with a whisk. Using a pastry brush, spread the crust mixture gently over the tops of the partially baked strudels. Immediately sprinkle each strudel with one-third of the almonds. Quickly return the pan to the oven and bake until the strudels are golden, sound hollow when tapped, and a cake tester inserted into the center comes out clean, another 15-20 minutes. Using a spatula, carefully transfer the strudels from the baking sheet to a rack to cool completely. Enjoy!